Select a watermelon that is firm, symmetrical, free of bruises and scars and heavy for its size. 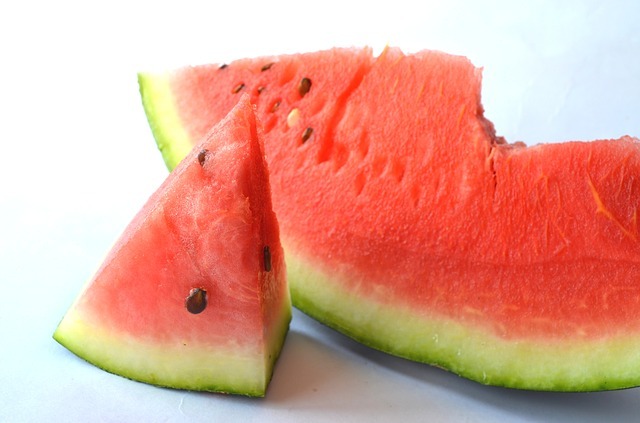 Ripe watermelon is deep green in color and should have a creamy yellow spot where it sat on the ground, if the spot is white or tinted green this might be an indication of a watermelon which is not yet ripe. The melon should be dull rather than shiny, shiny melons have not had time to fully ripen. Uncut watermelon can be stored at room temperature for up to a week in hot weather and longer in cooler weather. Cut watermelon should be sealed in a container and stored in the refrigerator for up to 4 days. Cut the watermelon into desired sized cubes or balls, removing seeds, and place it in a single layer on a baking sheet and put them in the freezer.Once frozen, place the watermelon pieces in a freezer container and store in the freezer. Watermelon that has been frozen is good for slush drinks or baking rather than eating raw. Watermelons need to ripen on the vine. They will get softer after being harvested but they will not get sweeter.